peek >> << backThe Florida Rock site in February, 2006. Jan. 3, 2017 - Rendering filed with the Zoning Commission in early 2017 showing both the completed 305-unit Dock 79 residential building at right and the updated design for its 264-unit sibling at 71 Potomac, to be called The Maren. 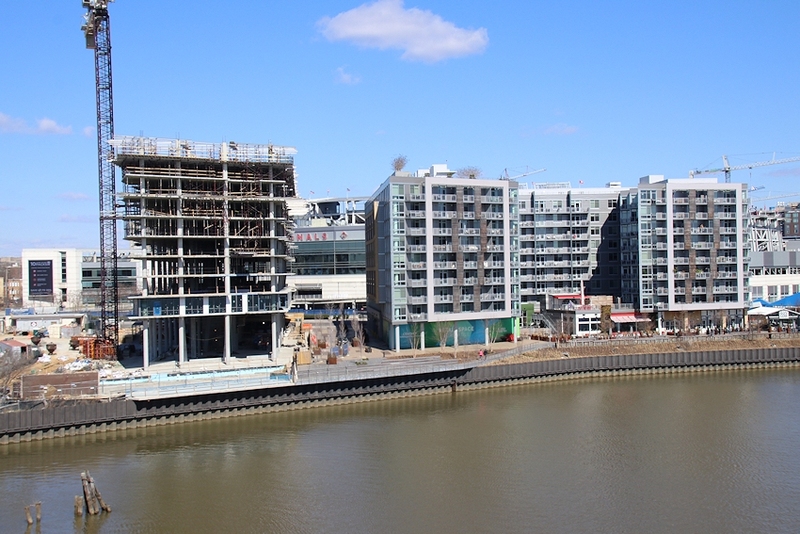 March 17, 2019 - A view similar to the above rendering showing the Maren, now out of the ground and visible from the Douglass Bridge, with its sibling Dock 79 to the right. 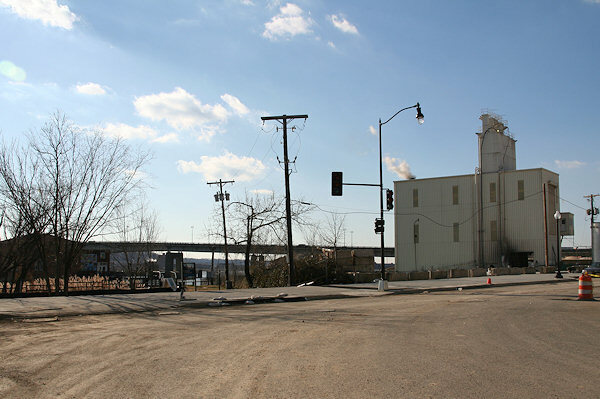 Looking across Potomac Avenue at what was then its intersection at Half Street, first when the land was a concrete plant and now the current view. 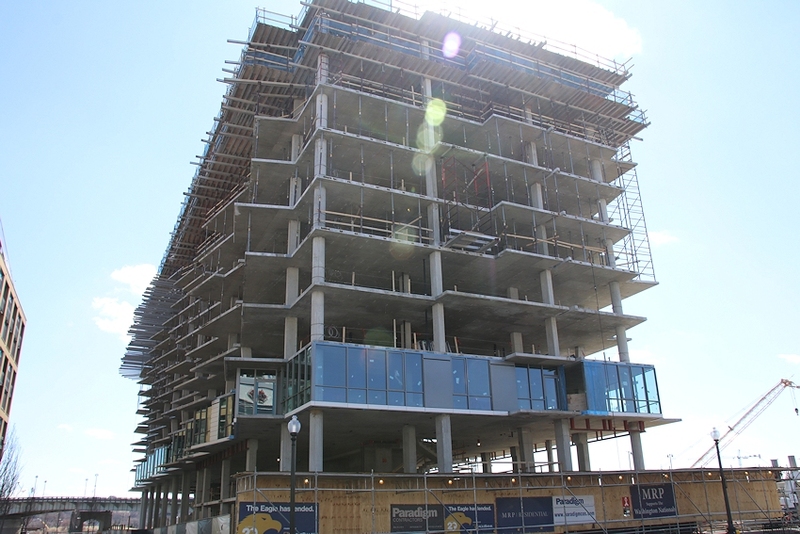 March 17, 2019 - A close-up of the early stages of the building's facing, along with visual confirmation that the building is indeed being called The Maren. 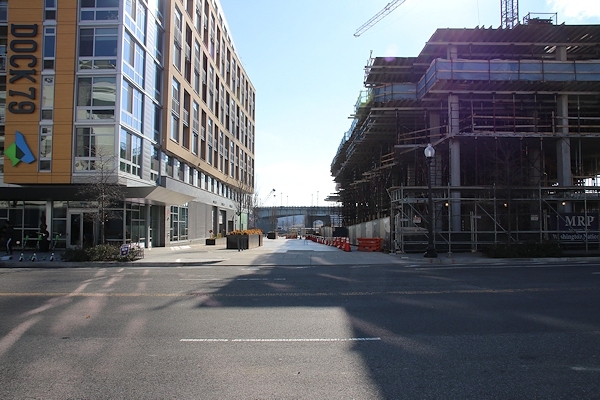 March 17, 2019 - The western side of the Maren, along with a view of the project's place along the Anacostia. 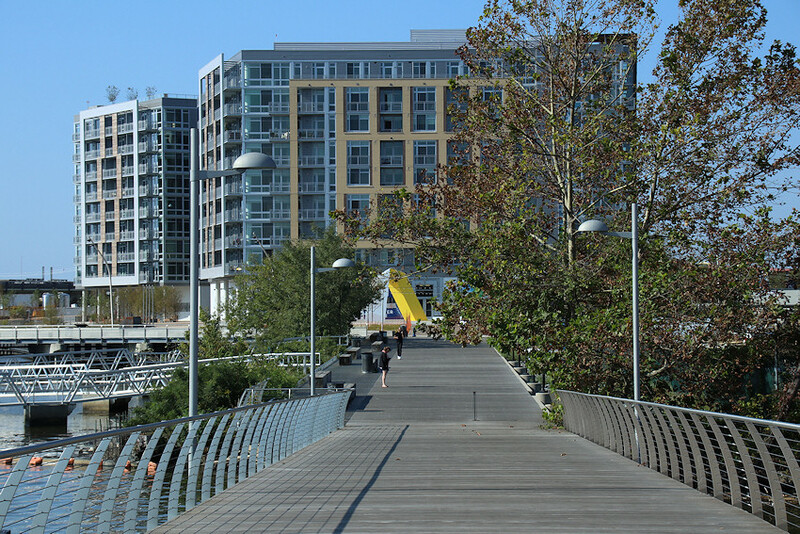 The Anacostia Riverwalk currently ends in front of Dock 79, but will be extended to the new Douglass Bridge and beyond. Jan. 3, 2017 - Another rendering of the Maren's riverside frontage and the passage between it and Dock 79, apparently to be called "Florida Rock Alley." Jan. 3, 2017 - Flipping around to see the Maren, Florida Rock Alley, and Dock 79, from Potomac Avenue. August 18, 2016 - Florida Rock Alley isn't quite an alley yet, but it is already a pedestrian and vehicular passageway. 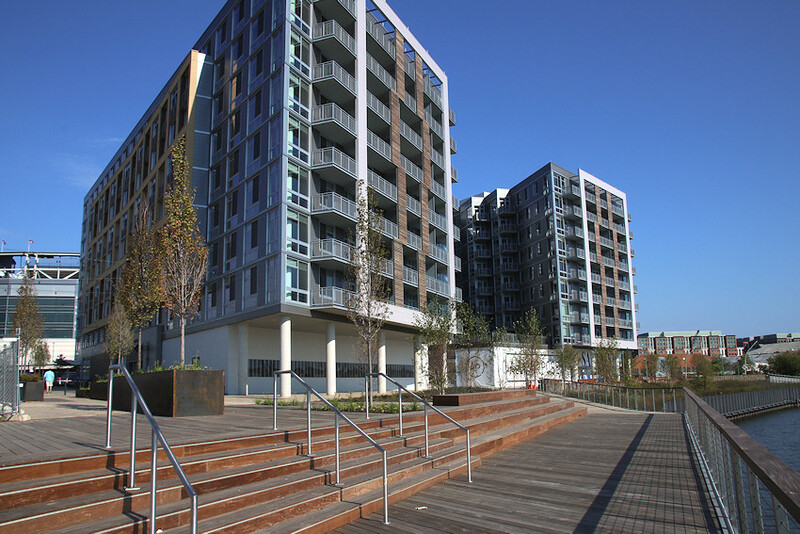 It is also where the shared bikes for residents of Dock 79 are parked. 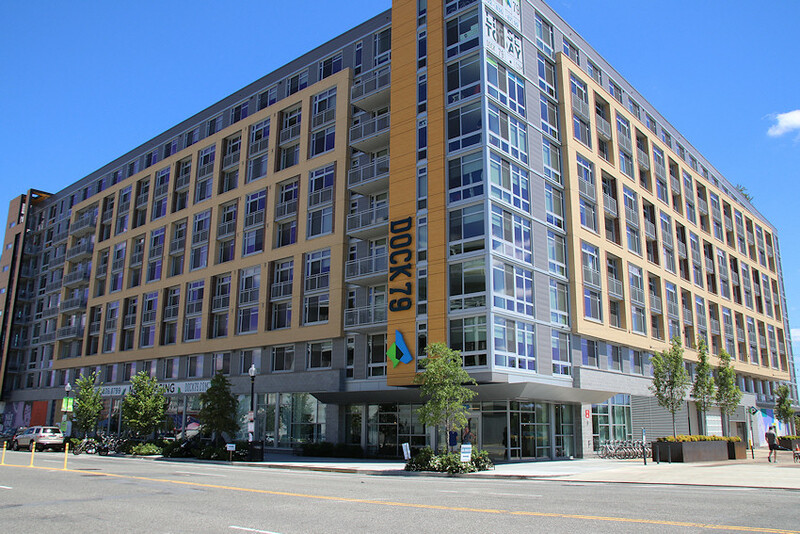 August 6, 2017 - Dock 79, completed, seen here from Potomac Avenue, SE. 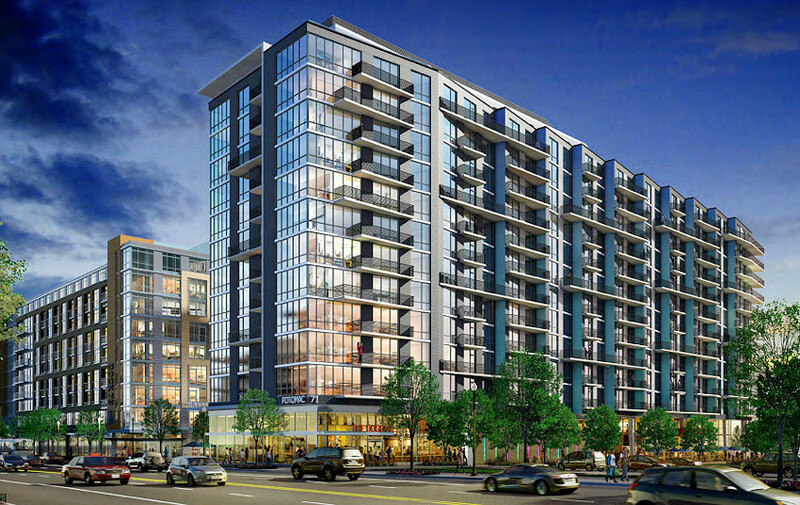 Jan. 3, 2017 - A rendering also showing Potomac Avenue, SE, but with the design for The Maren, the project's second phase. Dock 79 is at far left. June 4, 2017 - The water-facing side of Dock 79, along the Anacostia River. 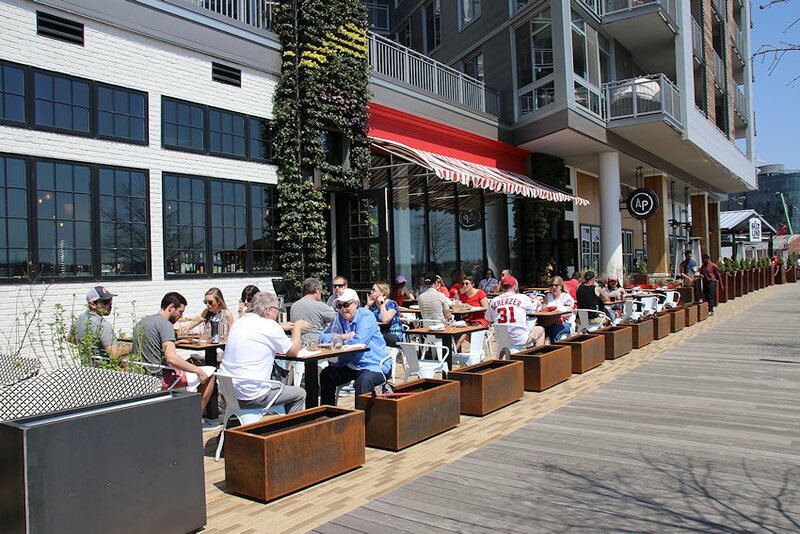 ;April 14, 2018 - Dock 79 welcomed All-Purpose Pizzeria in April, 2018, and it didn't take long for Nats fans to find it. 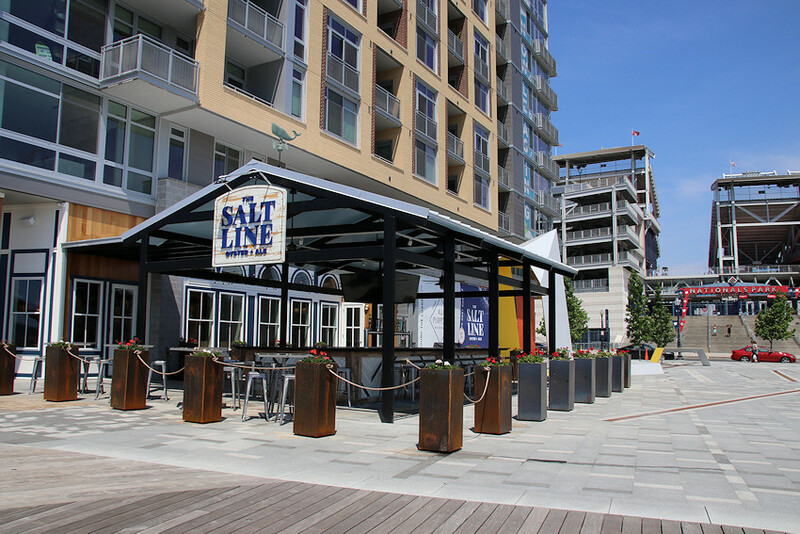 June 4, 2017 - Dock 79's first completed retail tenant, the Salt Line, offers a New England-inspired menu and outdoor seating within sight of Nats Park. 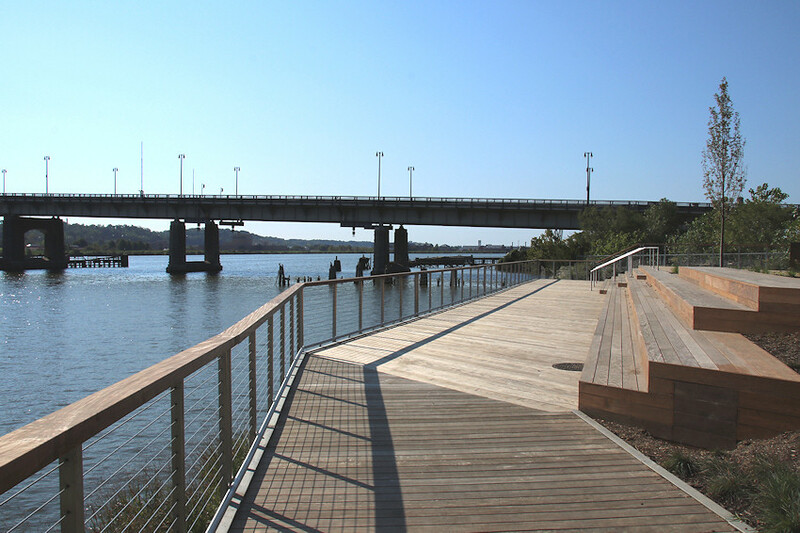 Oct. 16, 2016 - The new portion of the Anacostia Riverwalk that opened in front of Dock 79 in fall 2016. 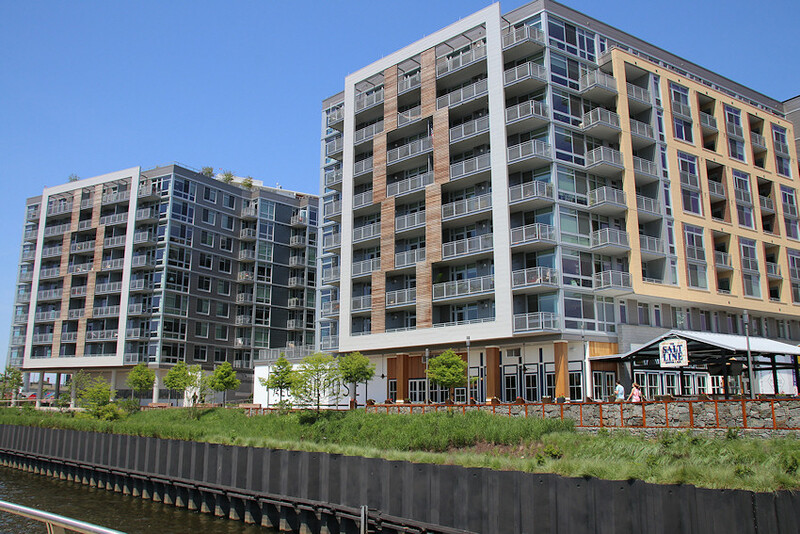 July 16, 2016 - The planned four phases of the RiverFront redevelopment, with Phase I's Dock 79 completed and Phase 2 expected to begin construction in 2018. Note that the two latter phases are dependent on the demolition of the existing Douglass Bridge. Oct. 16, 2016 - The public plaza's built-in tables, handy for carry out from the restaurants that will sprouting in 2017. Oct. 16, 2016 - Another view of the plaza. June 2008 - The Florida Rock site, as seen from the southeast viewing platform at Nationals Park in June 2008. The concrete plant eventually closed, and the tower was demolished in late 2011. May 28, 2016 - A slightly fisheyed panorama showing the same location nearly eight years later, with construction nearing completion. August 18, 2016 - The Dock 79 lobby, not long after the first residents began moving in. For more interior photos, see this gallery. August 18, 2016 - The common area for residents. For more interior photos, see this gallery. August 18, 2016 - A little bit of inspiration when working out. August 2005 - The "Florida Rock" property as seen from the Frederick Douglass Bridge in August 2005. Feb. 26, 2017 - The same view more than a decade later, with Dock 79 completed, the Bardo beer garden newly opened, and with something else kind of different, too. 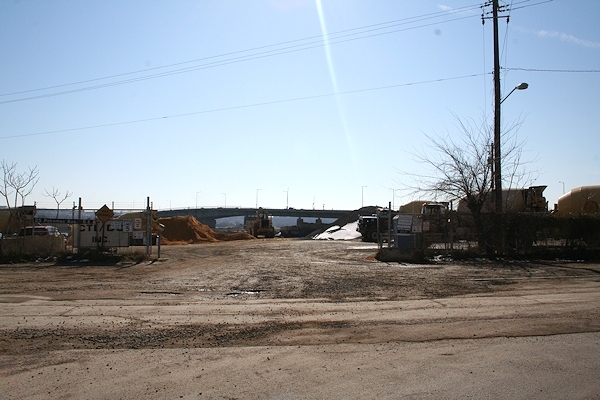 At 1st Street and Potomac Avenue, SE, the old concrete plant known as Florida Rock stood until November 2011. Now, the Dock 79 apartment building construction looms over what will be a new public plaza connected to Diamond Teague Park. Oct. 16, 2016 - The aforementioned steps, and the aforementioned view. Jan. 2, 2016 - A different view of the project's waterfront visage, as seen from Yards Park, with Old Town Alexandria visible downriver at far left (and the moon at upper right, to boot!). 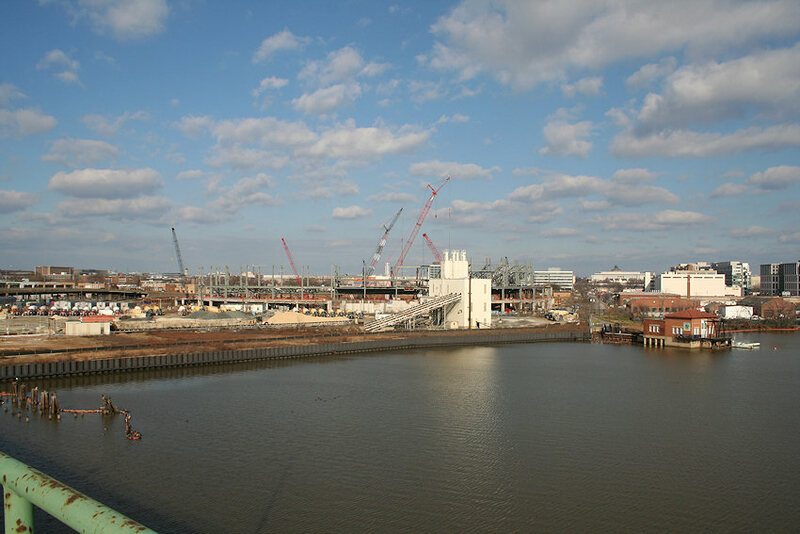 Dec. 24, 2006 - The 6-acre Florida Rock site, as seen from the Douglass Bridge, with the concrete plant still in operation and with Nats Park under construction just to its rear. The concrete plant eventually closed, and the tower was demolished in late 2011. Oct. 16, 2016 - The same view nearly ten years later, with Dock 79 and the plaza completed. 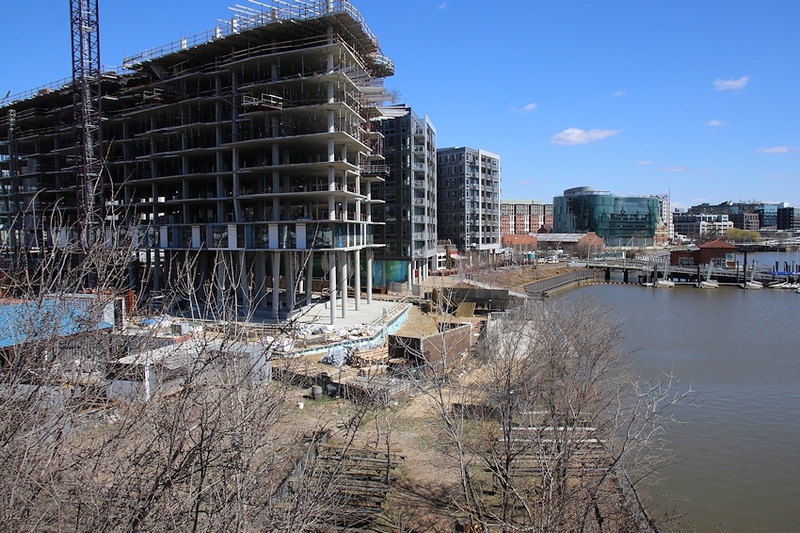 March 2005 - Looking at the RiverFront property from across the Anacostia River, at Poplar Point; the riverfront bulkhead marks the property's boundaries. Feb. 27, 2016 - The same view, more than a decade later. April 16, 2016 - And the same view more than years later, with Dock 79 nearing completion. Jan. 1, 2015 - The TV coverage of the NHL Winter Classic at Nationals Park helpfully provided this overhead view of the footprint for current construction, at right. Note: The renderings below are from the designs approved for the site in 2008. However, in 2011, the site's developers began the process of returning to the Zoning Commission to seek approvals for changes to the site's design, with a new architect. So the renderings you see here are, for now, merely interesting for a general sense of the site and for historical purposes. 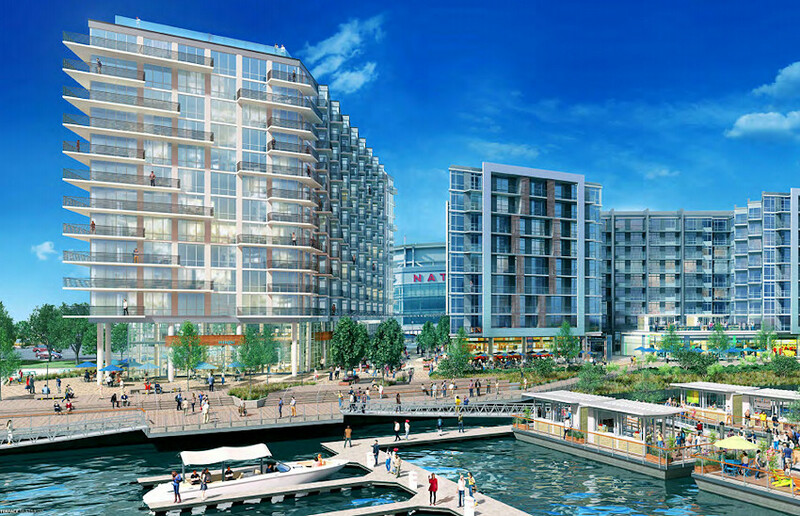 A January 2008 rendering of the 5.8-acre, four-building RiverFront project, as seen from the Anacostia River, with Nationals Park a strong presence just to its northeast. A hotel, two office buildings, a residential building, a riverfront esplanade, a glass-enclosed retail galleria, and a public plaza are all parts of this 1.1-million-square-foot proposal. 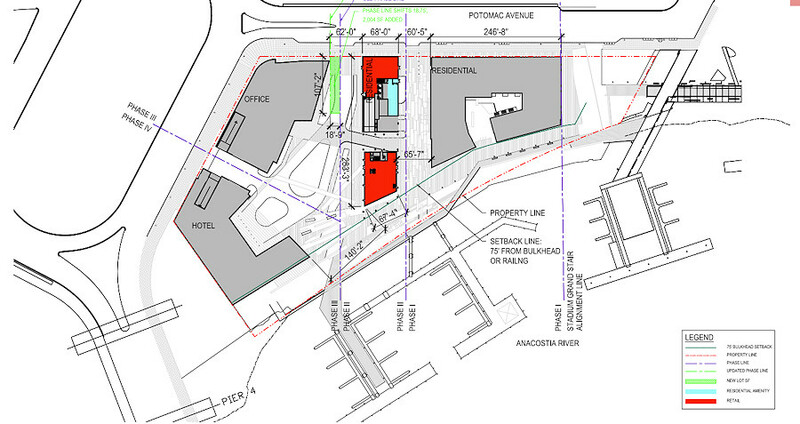 This site map shows the January 2008 revised design and layout, with the Nationals ballpark to the north, and to the left/west the eventual revised configuration of South Capitol Street (running in a traffic oval at the foot of a new Frederick Douglass Bridge). A January 2008 rendering of the eastern edge of the project, looking from Diamond Teague Park and Piers back toward the public plaza and the grand staircase of the ballpark. 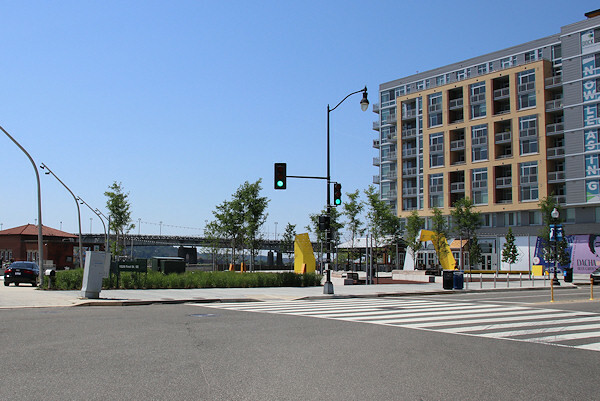 A public plaza on the far eastern edge of the project would complement Diamond Teague Park on its eastern side, helping to pull stadium-goers to the Anacostia riverfront and the Riverwalk esplanade. The eastern office building would be smaller than in previous designs, but would have much more ground-floor retail. To the west of the east office building would be "Potomac Quay", highlighted by a glass-enclosed 365-day-a-year galleria-type atrium. There would be ground-floor retail on both sides of the quay, and also a two-story destination restaurant on the south end of the Quay; a "watercourse" with fountains would run into and through the atrium. The residential, hotel, and west office buildings are now curved around the "Piazza Cascade", where an oval drive connecting the lobbies of the three buildings surrounds a large water feature. The Riverwalk and Esplanade remain unchanged from previous designs, with a depth of no less than 75 feet and with a bike path separated from the pedestrian areas. 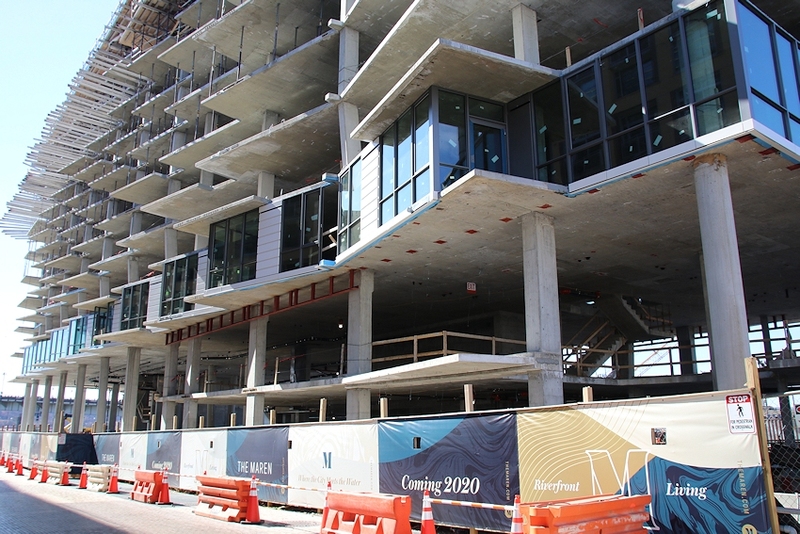 Construction of the project's eastern end (the eastern office building with ground-floor retail, the public plaza, and perhaps the glass-enclosed galleria) is slated to be first, with zoning approvals having been finally received (after 10 years of winding through the system) in 2008. Phase II would be the 160-unit residential building, and at the same time the underground parking and loading for the rest of the project would be built. Phase III would be the western office building, followed by the Phase IV hotel. The final two phases could not start until the new Frederick Douglass Bridge is built, since the old bridge is on the western edge of the RiverFront property. A December 2007 rendering, looking west on Potomac Avenue from First Street, showing RiverFront's northern side, facing the ballpark. The building at left is the east office building, which would be RiverFront's first phase of construction. The plaza at far left would flow into the city's planned Diamond Teague Park. The rendering also shows the ground-floor retail planned for all spaces along Potomac Avenue. A January 2008 rendering showing the western end of the development, which will border a new large traffic oval at the intersection of South Capitol Street and Potomac Avenue, when the new Douglass Bridge has been built to the south of the current one, which will be demolished. The westernmost portion of RiverFront in fact can't be built until the new Douglass Bridge is done and the old one removed, because the old bridge sits on part of the development's footprint. From left in this rendering you see the east office building, a sliver of the residential building, the west office building prominently at center, and the hotel at far right.